Anoola Vanilla Bardot Dress with Contrast Trim. This gorgeous vanilla tone pencil dress from one of our favourite designers Anoola is the perfect outfit for any Mother of the Bride or Groom. The soft crepe fabric of the dress falls to knee length. The bardot neckline features a complimenting rose gold jacquard fabric to provide a subtle contrast to the softness of the dress. Although the neckline is bardot, Anoola have provided detachable shoulder straps in the same crepe fabric as the dress to provide some extra support and coverage should the wearer require it. 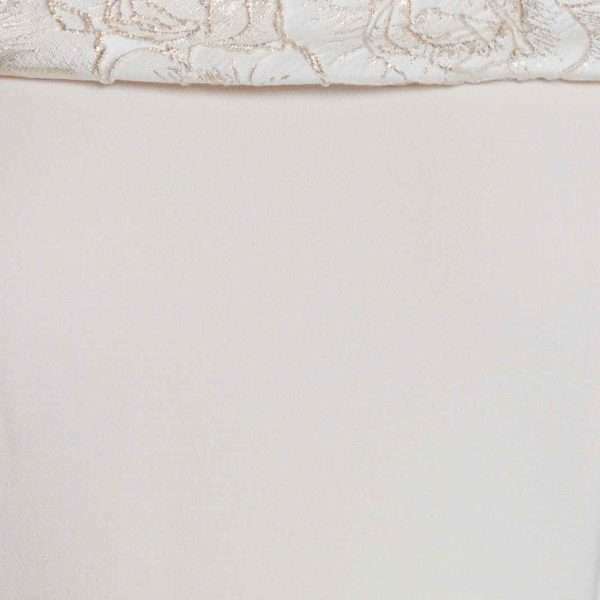 This dress also features a beautiful godet panel to the back of the dress in the same rose gold fabric as the neckline, providing a fluidity to the dress and a touch more interest for the wearer. A concealed zip and pearl button detail at the back of the neck offers a chic finishing touch. This would be a perfect outfit for a summer wedding abroad and will definitely be a memorable dress for your special occasion.